This clockwise loop rolls along the scenic vineyards and wineries around the Carneros Wine Region from Napa into Sonoma. Continue north through the valley into Glen Ellen for the climb up Trinity Rd to the junction at Cavedale Rd. Descend Trinity and Dry Creek for the return into Napa followed by a climb up the north side of Mt Veeder. Begin this ride from the corner of Golden Gate Dr & Stanly Ln in Napa. Enjoy the wildflowers along the edge of the vineyard! Head south on Stanly Ln for a leisurely roll through the beautiful Stanly Ranch vineyards. Head south on Duhig Rd to Ramal Rd; the road continues westward into Sonoma County through the gorgeous vineyards around the Carneros Wine Region. Meander around the country ranches and rural homes on Dale Ave. The turn on Burndale Rd takes you through the valley vineyards, wineries, and ranches along the east edge of Sonoma. Head west on Napa and Leveroni Rd along the south edge of town to Arnold Dr.
Arnold turns north as it heads through the valley towards Glen Ellen. Stop and enjoy the sculptures at Sculpturesite at Jack London Village! Continue on Arnold Dr through the town of Glen Ellen to Dunbar. Dunbar Rd rolls along the west side of Hwy 12 to Trinity Rd. Cross 12 and continue on Trinity; it ascends 3.1 miles to the junction at Cavedale Rd. It begins with 7-9% grades up through the shaded woodland to the driveway with the stone figures at mailbox 900. From there, the road kicks up for a steep winding climb to the first highpoint at mailbox 1255; it’s half a mile with stiff 12-16% grades! Trinity turns eastward as it continues climbing for the next 1.2 miles with an average grade of 8.5% to the next set of mailboxes at the white fenceline. The road continues winding uphill for another 0.6 mile with an average grade of 8.8% to the junction at Cavedale Rd-Mayacamas Fire Station. Stay on Trinity Rd; the road climbs gently through the shaded woodland before leveling out and dropping down to the hillside vines at Thomas La Tour Vineyards. The road name changes to Dry Creek as it crosses into Napa County; the twisty descent is fairly technical with many tight turns, it’s a little over two miles but the smooth pavement really encourages you to go fast-resist the urge and use caution! The forested road drops you down to the small bridge followed by a gentle scenic downhill run along the creek to the next climb on Mt Veeder Rd. 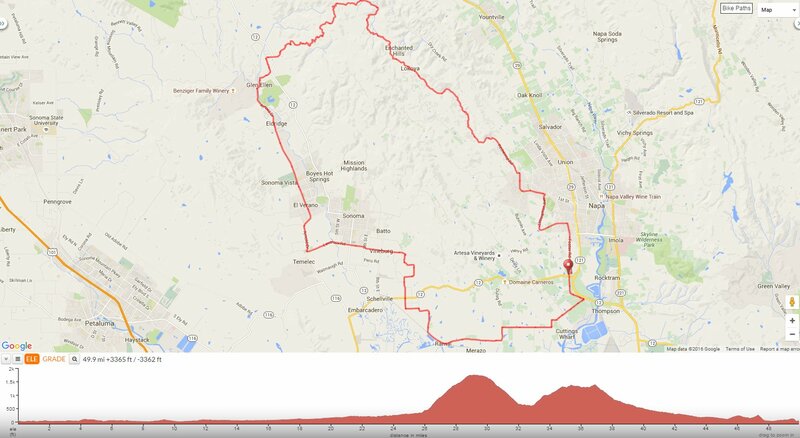 Mt Veeder Rd climbs close to 800′ in 4 miles. The first 0.7 mile after the creek crossing is the steepest section with 10-13% grades along with full sun exposure! At the false summit, Mt Veeder Rd continues for the next 2.1 miles on gentle rolling terrain through the woodlands and hillside vineyards. The short climb leads up to the summit at Wing Canyon Vineyard. The descent on Mt Veeder Rd down through Pickle Canyon is fast-use caution around the tight turns and watch for potholes! Mt Veeder Rd ends at the junction with Redwood Rd, go straight onto Redwood. The road continues winding down the shaded canyon on smooth pavement along Redwood Creek into Napa. Meander through the residential neighborhoods on Browns Valley Rd. Head south on Thompson Rd; the gentle 0.7 mile climb up to the vineyard has an average grade of 3.6% followed by a descent to Congress Valley. Turn east on Congress Valley Rd for the climb up Old Sonoma Rd; it’s 0.4 mile with 4-6% grades. Old Sonoma Rd drops into the south edge of Napa to Foster Rd. The flat-rolling terrain on Foster Rd exits the residential neighborhood as it goes across the valley with scenic views of the open meadows and Vaca Mountains in the far distance! The road comes to a T junction at Golden Gate Dr; the next few pedal strokes takes you back to the ride start off Stanly Ln. Wildflowers along Stanly Ln & Golden Gate Dr. This is a wonderful ride that takes you through the beautiful rolling vineyards and wineries around the Carneros Wine Region from Napa into Sonoma. You’ll need to work a bit harder through the second half of the ride with the steep climbs up Trinity Grade and Mt Veeder-it’s both challenging and rewarding at the same time! You’ll enjoy these quiet back roads with minimal traffic and grand views! Weather: Sunny and warm. Temps ranged from the mid 60’s to the high 80’s with strong NW winds.